And even more significant, his school has undergone a transformation, now housed in a new, singular building instead of being spread out; no longer being special needs guests in a series of larger, typical, Catholic Schools. That my son no longer has a cross in the logo on his sweatpants when he goes with me to pick up his brother from Hebrew School is comforting. But change is hard for kids on the autism spectrum, and it has been a while since I've seen Jake as anxious as he was this morning. It started with the actual lack of a uniform. Jake has been used to one for two years now and the idea of free choice in school clothing didn't sit well with him. We got through it - he finally accepted the plain, red shirt in the same style as his former uniform shirts - but I knew it was a harbinger of things to come. 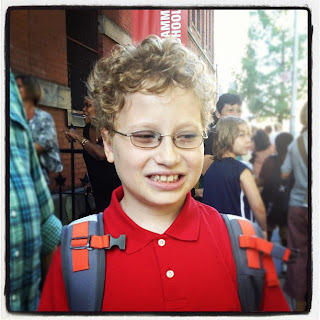 The trip downtown to his new school building now requires either two or three subway train changes and a seven block hike, as opposed to a straight shot on the subway line closest to out apartment and then a short three block walk. The fact that Mommy & Daddy didn't know where they were going (why oh why did I not do a dry run this summer?) was not lost on him, heightening the anxiety. "Where is my school, Mom?" he kept asking. And thank goodness for Mr. GPS in my phone, allowing me to say "Five more blocks, Jake... four... three... two... one... we're here!" That we were greeted with enthusiastic warmth and hugs from so many was not unexpected. I LOVE this school in every way imaginable and am grateful for it every day. But for Jake the few familiar people, even though much beloved, were not enough. So much else was new, new, new, and he was quiet and withdrawn in a way I haven't seen him in a long time; my over-the-top loud talking-all-the-time child disappeared. His voice, answering his new teacher's questions, rose barely over a mumbled whisper; he wouldn't look people in the eye. I know this will change as he gets more comfortable, as the new teachers and new kids in his new classroom become familiar friends over the course of the next few weeks. But still, as a mother, my heart kept clutching in my throat as I felt my son shut himself back inside, a shadow of the dark old days I would rather forget. But the bottom line is: I trust this school and the people in it, completely. They love, respect, and hold the bar high for my son; for all the children in this school. And I know how lucky I am, we are, to be able to feel this way. So tomorrow morning when I put Jake on the bus (please bus, come something like on time!) I will do so with only a minimum of trepidation, knowing I am sending him somewhere where they "get" him, where they are as committed to seeing something wonderful blossom forth from my boy as we are. Here's to a great new school year for all our kids! How are you and yours doing this year?